Back in February of this year I posted two images of vanadinite crystals. The subject of this post is in the top image of that post. 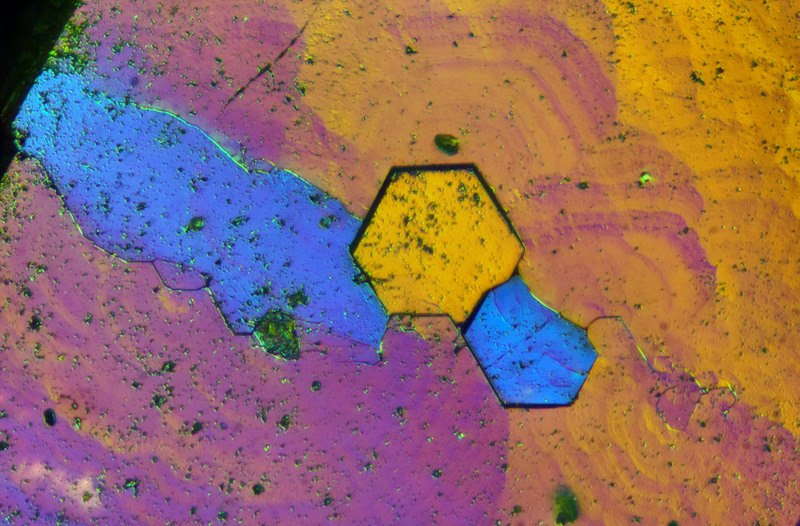 The image showed small crystals that had grown on it’s face surface. I thought this was odd along with the lack of smoothness on the crystal surfaces. I have revisited this crystal with a new form of analysis. 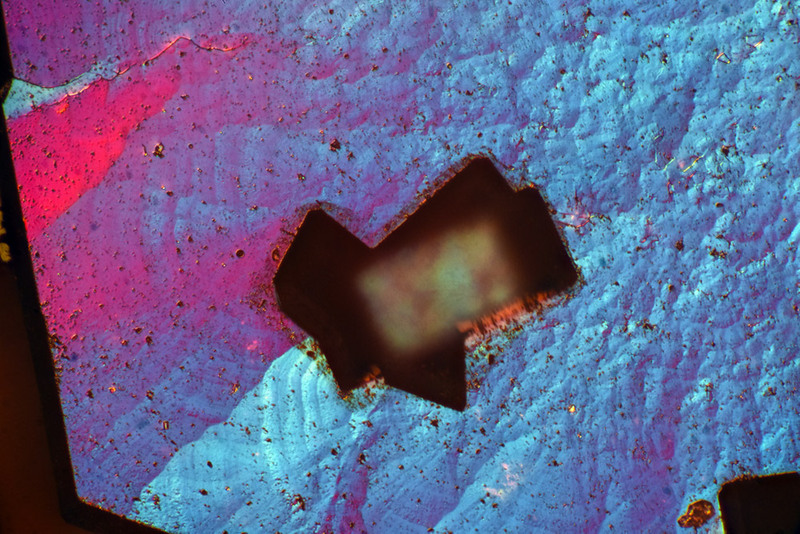 Image 1 - The face of a single vanadinite crystal in the reflected light of a Francon - Yamamoto compensator producing differential interference contrast. Black zones around the rectangular block below and left of center and at the bottom right are a result of other vanadinite crystals. They are blocking the light from reaching the face surface of the main crystal. They are at the wrong angle to reflect light back to the compensator. Nikon 4x plan objective. F.O.V. = approx. 2mm. 8 images at 20 microns. Image 2 - The same crystal face with the Francon - Yamamoto compensator set to a different position providing a different optical painting. Both positions for each image were tuned to present the greatest amount of relief detail. 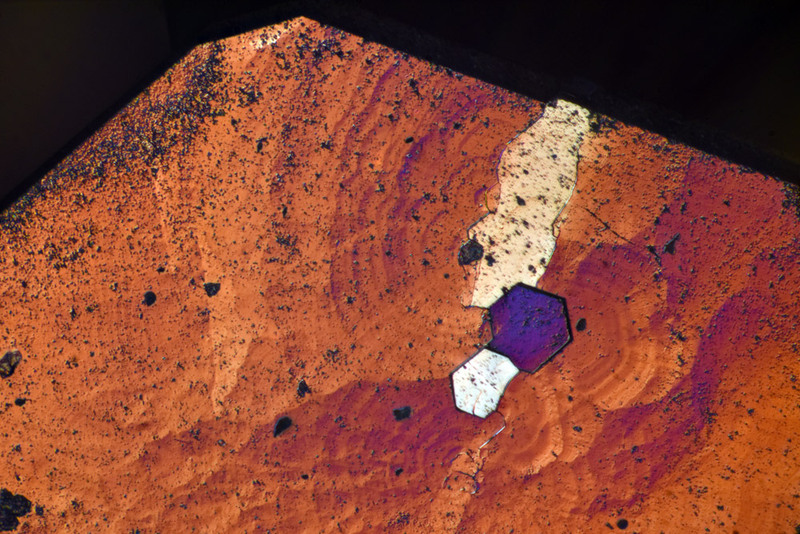 This image is a slightly deeper stack showing the edge surface of one of the smaller vanadinite crystals. It is not showing color, but does show the pock marked surface features. Nikon 4x plan objective. F.O.V. = approx. 2mm. 12 images at 20 microns. 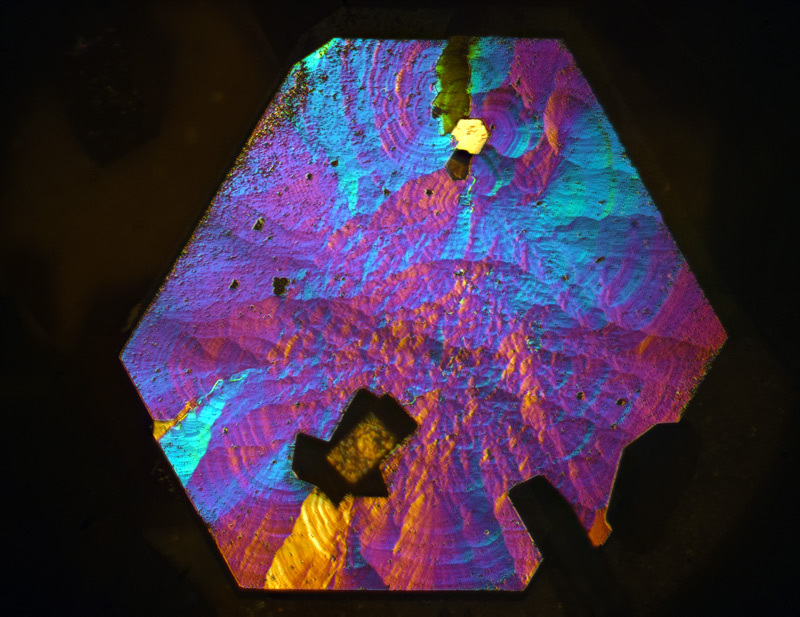 Image 3 - The upper portion of the subject showing the ridged disturbances in the surface of the crystal due to an error in its formation. The edge of the crystal where the left side of the elongated white feature meets the edge is in a different plane. 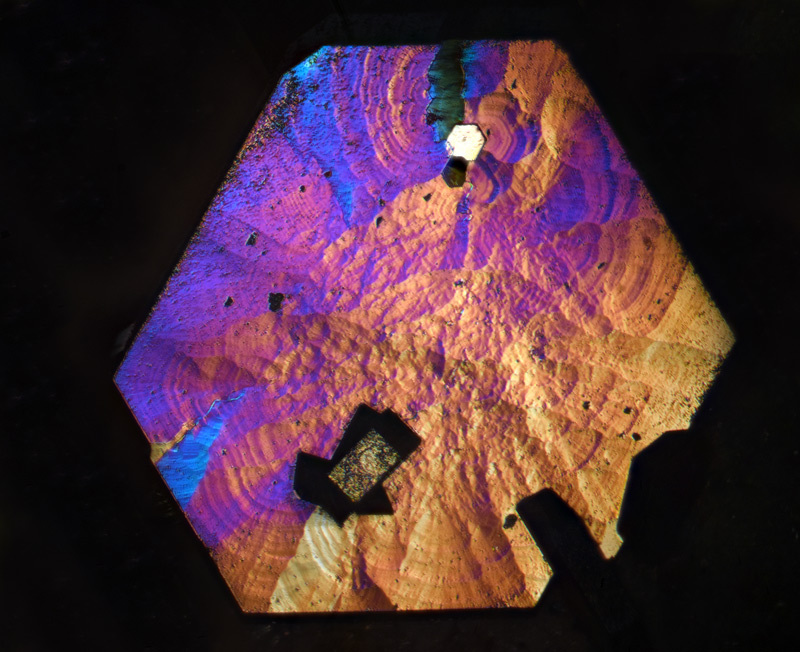 Two new smaller vanadinite crystals (white and purple) have formed on the surface and display similar ridged patterns to their right. The black spots littering the surface are not dirt, but holes in the surface. Reichert 10x achromatic objective. F.O.V. = 1mm. 14 images at 5 microns. Image 4 - The lower half of the crystal with three intertwined minor crystals assembled atop the face of the host crystal. Their formation seams to had less of an impact than the smaller two on the upper half. Another edge plane displacement can be seen at the extreme upper left, resulting in a crack. If you look very closely at the extreme upper right, three and a half sides of a minute crystal appear out of the surface. Reichert 10x achromatic objective. F.O.V. = 1mm. 13 images at 5 microns. I recently had time to resurrect an accessory from my old Nikon Su type microscope collection. It is called a Francon - Yamamoto reflected light DIC attachment and it has proven to be a powerful tool in looking at the surfaces of small crystals. It may not answer all the questions in my mind about crystal growth but it generates extraordinarily detailed images of crystal surfaces. They allow many inferences to be made. To say that the vanadinite crystals lack a smooth surface is an understatement. Pock marked with holes, cracks, depressions and what may be some form of pressure gradients, they are real mess. But a beautiful one. In leu of the surface condition, Rik Littlefield’s comment (previous post) on a crystal starting from a seed begs the question; would a seed find itself into a hole or a crack like a weed seed? A new crystal could find itself growing anywhere on the face were a hole or crack are present. At the present time the number of observations has been small, but the most intriguing crystals are those imperfect or disturbed ones. While crystal collectors may gravitate towards the most perfect of specimens, I will enjoy the imperfect. I invite your perceptions of what these images may reveal to you. Nikon SuBR microscope with Differential interference attachment “R”. PFM Microreflex assembly with Nikon 5x CFE projection eyepiece. Nikon D810a camera. Aside from the spectacular beauty of these images, the physics of the method (Francon - Yamamoto differential interference) is quite elegant. I found this article (link below) to help explain the technique which is new to me. The ability of F-Y interference to display very subtle variation in surface height is extraordinary. This technique reminds me a bit of the “optical flats” used to measure surface flatness. Thanks for sharing these Walter!